SYNOPSIS: Tartuffe is a con man posing as a religious guru in order to dupe a rich Parisian named Orgon. The latter is so beguiled by Tartuffe's sanctimony that he gives him his daughter's hand in marriage and the deed to his house. Seeing their inheritance snatched away, Orgon's family tries various schemes to disabuse Orgon of his delusions. 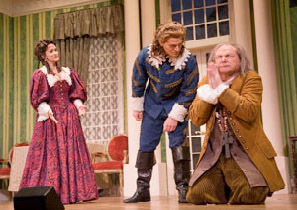 Orgon has married a younger woman, Elmire, whom Tartuffe tries to seduce. The only sensible person in the family, she turns the villain’s lust against him in what one critic called “the funniest seduction scene in opera.” With the help of disguise, the young lovers and the saucy maid, Dorine, finally outwit the lecherous fraud and he runs for his life. Mechem’s libretto makes several changes in the original play, most notably enlarging the women’s roles and doing away with the deus-ex-machina ending. ". . . a delight. . . a high spirited farce, full of sparkling word-plays and internal rhymes. The overall invention and genial good nature of this score remain impressive indeed. . . recalls 'Falstaff.'" "The greatest pleasure of the evening was Mechem's music, fresh and humorously parodistic. . . Despite the cheerful parodies of earlier composers, this melodically beautiful "number opera" has the stamp of its composer's own individual style." — Kurt Herbert Adler, General Director, San Francisco Opera. 1 Opening scene. Orgon’s mother, Madame Pernelle, castigates every member of the family for not honoring “that holy man,” Tartuffe, whom Orgon has brought into the house. 2 “That man's a saint.” Orgon's Aria. He recollects meeting Tartuffe in church for the first time. He sings nearly every cliché of operatic religiosity. 3 “Fair Robin I love.” Dorine, the cheeky maid, instructs Mariane, Orgon’s seventeen-year-old daughter, on how to deal with men. 5 Act II, Tartuffe’s entrance. We finally get our first look at the scoundrel we’ve heard so much about. 6 Act III opens with Elmire’s recitative, aria and cabaletta. 7 Seduction scene. Elmire makes Orgon hide under a table so that he can see Tartuffe’s “lecherous larceny” with his own eyes. But Orgon must promise to come out when she coughs, a signal that the hypocrite has gone too far. She invites Tartuffe into the room and pretends to respond to his advances. MOLIÈRE’S Tartuffe had been a favorite play of mine for years, but not until I saw the American Conservatory Theater production of it in San Francisco in the early 70’s did I realize its possibilities for comic opera. The rhymed verse, the stylized, broadly comic acting bordering on choreography made Tartuffe almost an opera buffa without music. It became one of A.C.T.’s greatest successes. The director, William Ball, certainly knew that both Molière and opera buffa had their roots in commedia dell’arte; his production reminded me of this important fact. There are really two Tartuffes by Molière—the three-act comedy he originally wrote, and the five-act comic morality play he was forced to make of it in order to get it past the censors. Unfortunately, we have only the latter, but evidence suggests that the first version was a straight satire of human character. The tedious disclaiming of impiety and the deus ex machina ending are generally acknowledged to be unwelcome additions. But an opera is quite different from a play, and librettists are given license to make changes not permitted in the spoken theater. I removed whatever I thought Molière had added against his will, and invented an ending which conforms as closely as possible to his own without requiring the gratuitous intervention of the king. Being my own librettist, I was able to reconstruct the play along musical lines, making further changes as I composed the music. Parody, including the occasional outrageous quotation, is a trenchant form of satire, whether verbal or musical. The operatic Tartuffe’s audiences and critics have shown by their laughter and their generous reviews that they understand this very well—only one or two humorless music critics have missed the point. One wrote a review about the “bewilderingly eclectic music” without giving any hint that satire or parody were involved. But because I occasionally parody a style (as in Orgon’s aria) rather than a specific piece, the reverse of this happens more often. In their eagerness to catch all the references, listeners frequently credit me with parodying or quoting composers and musical passages that I don’t even know. Relax, folks, there aren’t many quotations. Tartuffe is a “numbers” opera because I wanted to revive the flamboyant spirit of Molière, which considerably predates 18th century opera. We know that Molière was a great actor of farce; it is a mistake to load onto his plays the dark “social commentary” style of the 20th century. In his preface to Tartuffe, Molière wrote, “The most beautiful ideas in a serious philosophy are less powerful most of the time than those in a satire. . . . It’s a terrible blow to vice to expose it to everyone’s laughter. One can easily bear reproof; but no one can bear to be mocked . . . no one wants to be ridiculous.” Yet the idea persists in some quarters that Molière’s plays (and operas made from them) must be produced with a bitter, even somber tone; otherwise they are not to be taken seriously! And even Molière has occasionally suffered from the kind of obtuseness that cannot differentiate between parody and pilfering. It has been written and often repeated that Molière is one of the few great writers who has no style, but rather the styles of all his characters. There is a grain of truth in this but it omits the important fact that his characters didn’t write the plays—Molière did. And though I have followed his example in using satire and burlesque—both verbal and musical—99 percent of the music is, for better or worse, original. I must also point out that satire may be either witty or heavy-handed. A pun may be funny or dumb. If the Beethoven quotation in Act III did not grow naturally out of both the situation and the musical material, it would not give listeners a swift perception of an incongruous relationship and they would not laugh. It is certainly true that one can overdo this kind of humor. Particularly in music, comic effect is not enough to sustain interest very long—not, for instance, through an entire duet like that of Dorine and Mariane in Act I. Musical and dramatic movement must be maintained or the joke wears thin. But the effect need not always be purely comic. Gentle satire can produce charm, amusement, or “set up incongruities which serve in a kindly way to demolish falsehood and reveal truth” (S. Leacock). The composer cannot, of course, be his own judge. I can say only that I have tried, like Yeats, “to rediscover an art of the theatre which shall be joyful, fantastic, extravagant, whimsical, beautiful, resonant and altogether reckless.” It sounds like a good description of Molière. From program notes for Lake George Opera’s Tartuffe, 1982. Revised and expanded, 1993.